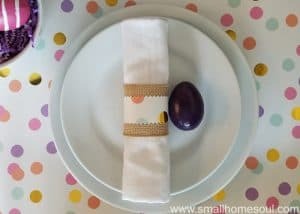 Easter Bunny Wreath - Easy Update to a Seasonal Wreath - Girl, Just DIY! Every child eventually learns that the fairy tale figures of youth don’t last to adulthood. But that doesn’t mean we can’t play along for as long as possible, heck, even after your own kids are grown. For many years after my daughter was grown I made her play along on all the holidays. Secretly I think she really enjoyed it. All the pretending doesn’t keep you from forgetting your own childhood moment when reality became clear. 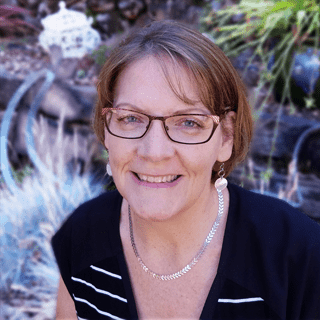 You knew something was up and discovering the secret was at the same time exciting and disappointing. What happens now? Am I gonna still get candy and colored eggs? How old were you when you realized there was no Easter Bunny? I can’t remember how old I was (probably 7ish) but the moment is burned into my memory. We rushed downstairs to find all nine of our Easter Baskets lined up on the dining room table. I was the youngest but because there were so many of us the Easter Bunny always labeled our baskets. I’m not sure how he knew our names or our birth order but he always got it right. All nine names appeared in the same order every year. 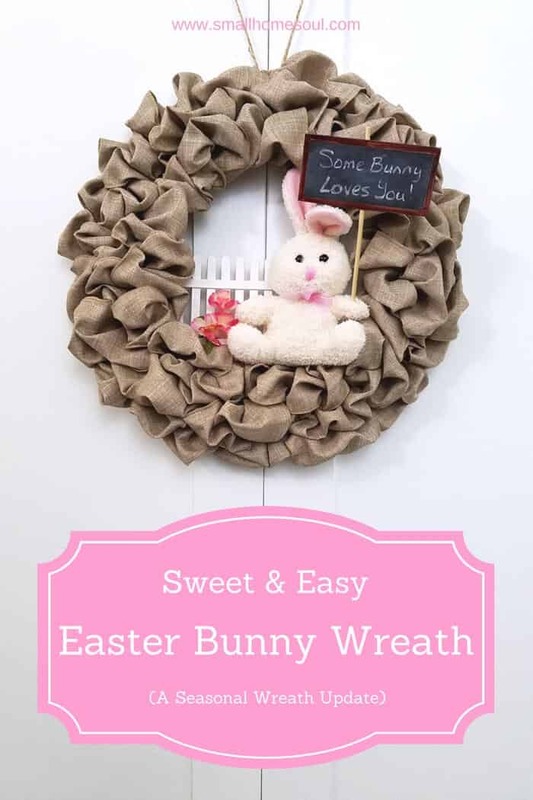 When I started planning to update the Seasonal Wreath I created earlier this year I knew I wanted the Easter Bunny to be a part of the transformation for an Easter Wreath. 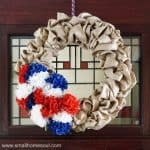 You can read all about how I made the basic wreath from this link to that post. Shopping at the Dollar Store I found an adorable bunny that would be the focus. Next I came up with my plan. 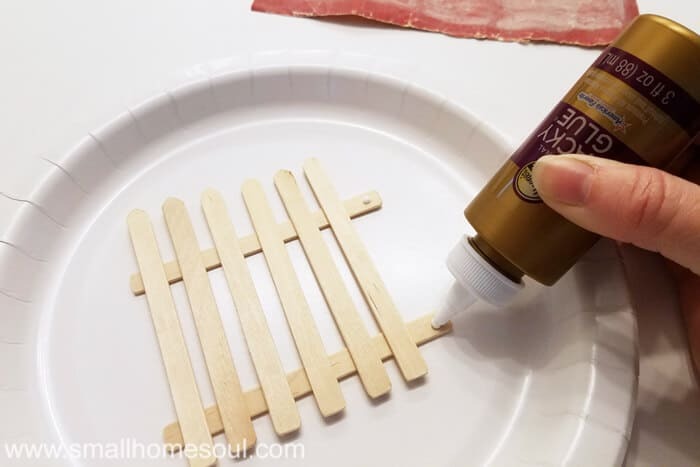 I had craft sticks at home and I knew I could fashion them into a cute little fence. After I got home I got busy building my fence. 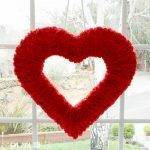 I laid out some craft sticks into a picket fence design to determine how many I’d need. Now I just needed to make them them look like actual pickets. 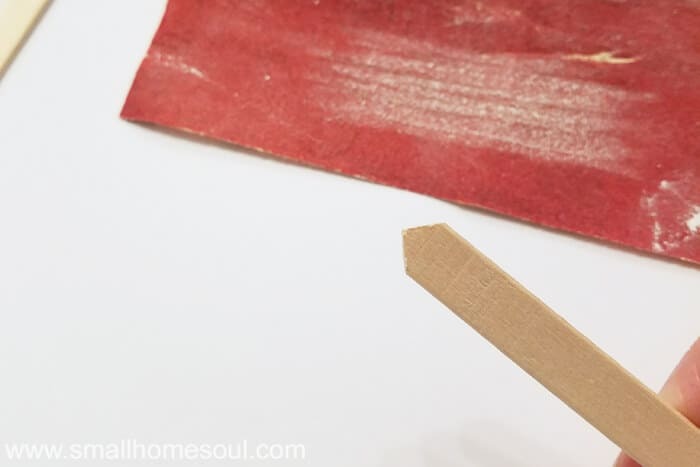 I grabbed a sheet of sandpaper from the garage and holding the craft stick at a 45 degree angle I drug it across the sand paper in one direction 15 times. Then I flipped it and sanded the other side. After the pickets were pointy I squared off the bottoms as well and assembled the fence using the Tacky glue. I laid them where I wanted and picked up each picket as I glued them and laid it back down. You’ll have just enough time to adjust them to the spacing you want. 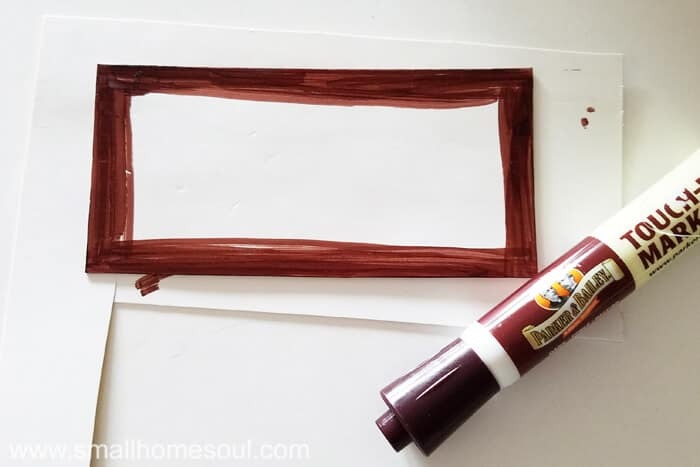 Scrape away any excess glue and after it’s dry give it a coat of white craft paint. 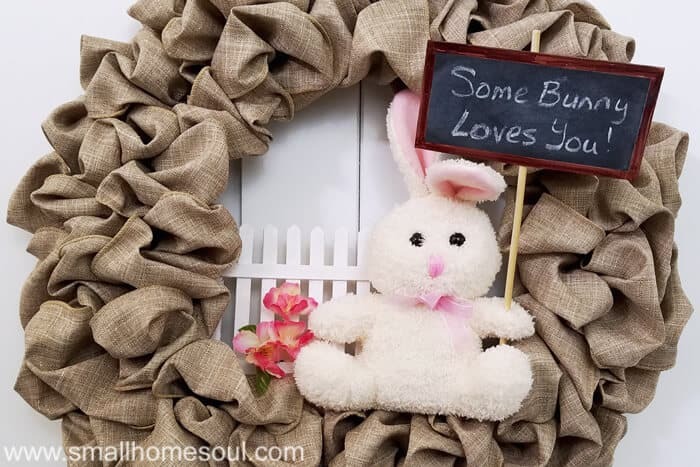 I wanted Mr. Bunny to hold a sign with a cute saying I first saw my friend Sam from Raggedy Bits use on a free printable she made last year. But first I needed the figure out how a stuffed bunny with no fingers was going to hold anything. That’s where the bamboo skewer came in handy. 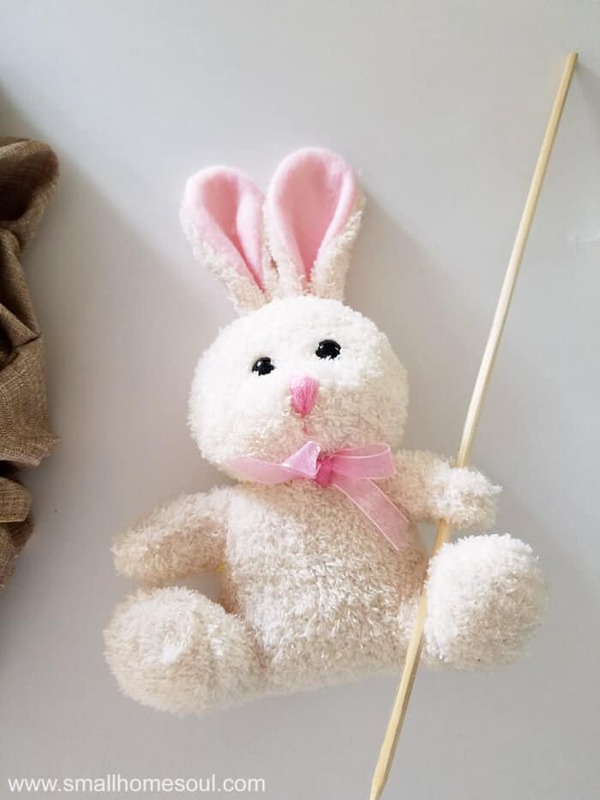 Since Mr. Bunny was from the Dollar Store it was pretty easy to get the skewer between the fibers of the fabric. But not so easy that it would slip around. Now to make his sign. 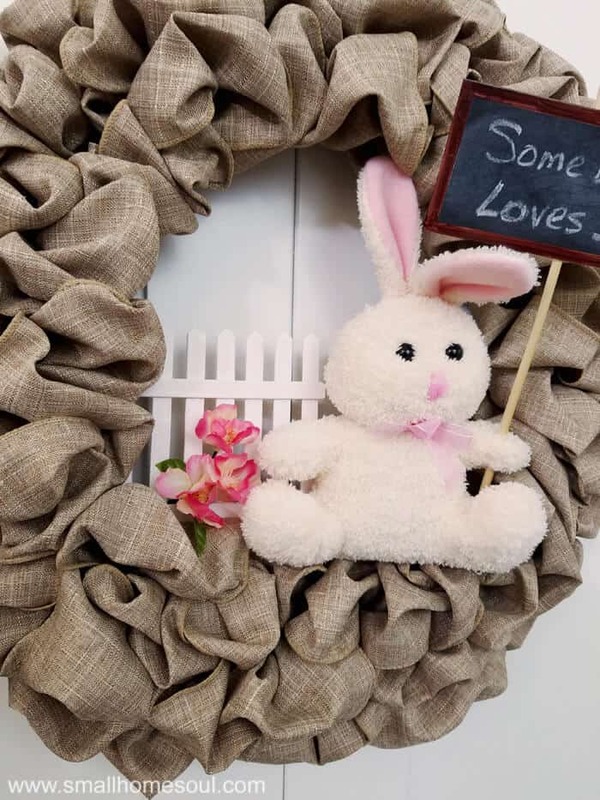 Since this Easter Bunny Wreath is temporary I wasn’t too worried about making something that would hold up for a long time. 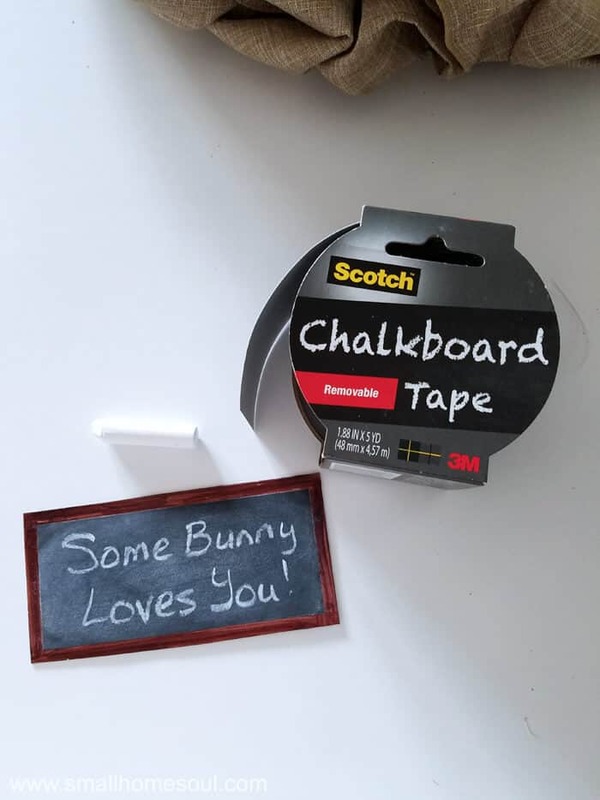 But I wanted it to look like a chalkboard sign. So I grabbed some poster board I’d been using for a few projects and cut a square. I folded it over and glued it with more Tacky glue. Then I grabbed my furniture markers and outlined the edges of the poster board to give it a wood frame look. The marker on the shiny side of the poster board sort of looks like wood grain. Now just a little chalkboard tape and more Tacky glue to glue the sign to the skewer. The secret was out, the last of my mom’s kids figured it out with the trail of clues she left behind 😉 It’s a right of passage every child experiences, but I played along for a few more years before I gave it up. I wanted to make sure the candy kept flowing. 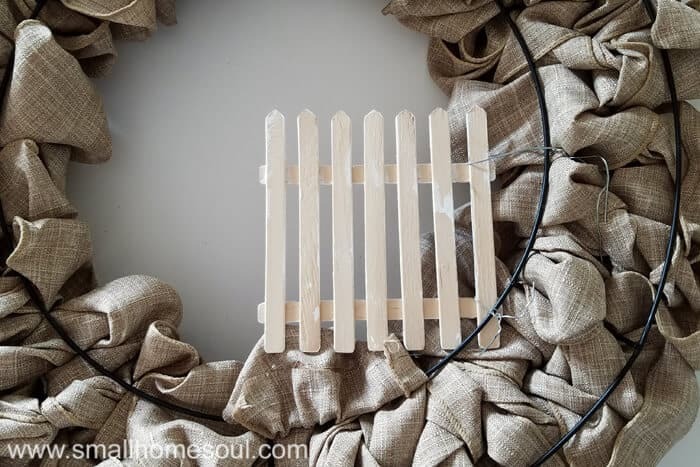 After the paint on the front side of the fence was dry I loosely connected the fence to the wreath ring on the backside with the wire. I had to play with it a bit so the fence was straight. I used the same wire threaded through Mr. Bunny’s backside to fix him to the Easter Bunny Wreath. A few fake spring flowers peeking through the fence finished it off nicely. 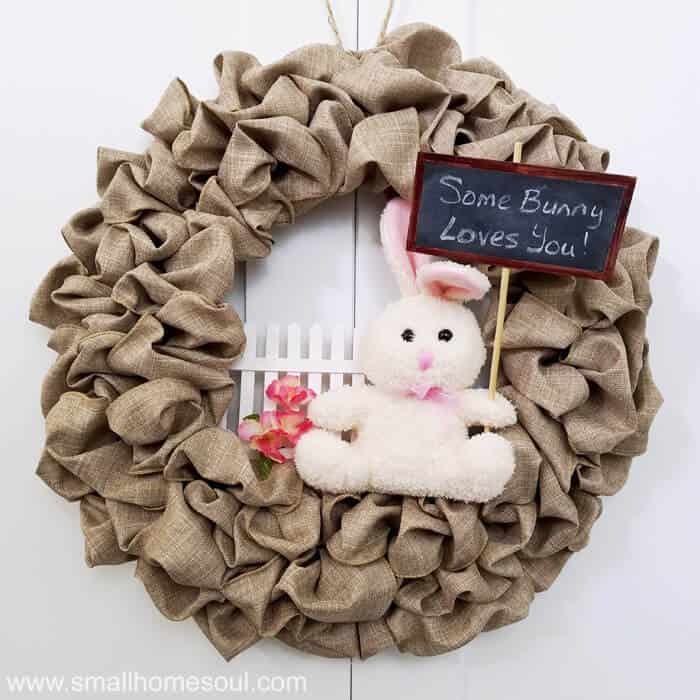 If you love Mr. Easter Bunny and this Easter Bunny Wreath as much as I do please Pin it so you have it handy when you’re ready to make your own. 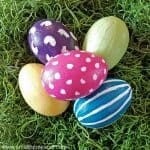 Leave a comment below about the time you (or your child) found out the truth about the Easter Bunny.